The Kagoshima Naval Air Group Sekishin Monument, erected in 1976 in Kamoike Park, is the second monument to remember the young men who graduated from training at Kagoshima Air Base and later died in battle. The first monument, called the Kagoshima Naval Air Group Monument and erected in 1966, is located near Kamoike Kominkan (Public Hall). The Navy established Kagoshima Air Group in April 1943 to provide basic training for airmen who joined the Yokaren (Preparatory Flight Training Program). Many graduates, including those from Kagoshima Air Base, died in battle as members of the Kamikaze Special Attack Corps. This area, where Kinko Bay's blue waters lap against the shore in view of Sakurajima spirits who change in the mountain light of morning and evening, is the former site of the Kagoshima Naval Air Group. Patriotic youths volunteered and gathered here from all over the country with the aim of protecting the skies as they sacrificed themselves during an unprecedented national crisis. Here was the site of the Yokaren barracks where they endured very rigorous training and carried out their mission. Yokaren was the name given for the Navy's Hiko Yoka Renshusei (Preparatory Flight Training Program trainees), that is to say the Navy's Youth Pilots. It rose from the viewpoint that talented air warriors depended on early education of gifted individuals. In June 1930, it was established as the Yoka Renshu-bu within the Yokosuka Naval Air Group. Soon this training program moved to an area by Lake Kasumigaura, and it became independent with the name of Tsuchiura Naval Air Group. With the pressure of the Greater East Asia War situation, a rapid increase in airmen was required, and the Kagoshima Naval Air Group was established here on April 1, 1943. Formerly in this area of Kamoike, plans were made for a joint land and sea airfield operated by the city, but this was taken over by the former Navy. In 1941, Kagoshima Air Base was established, and it had a key role as a fleet air base or as a transfer base toward the south. Furthermore, the Kagoshima Naval Air Group was established and carried out education of Yokaren trainees. In January 1944, midway through their studies, Navy Yobi Gakusei and Yobi Gakuto (both translated as Reserve Students) hastened to join the air group here in response to the country's crisis. Together they spent all of their time completely devoted to rigorous training. As the war situation suddenly changed, the shortening of the training program was unavoidable. The youths left the nest one after another, and they became the core of the Special Attack Corps and fought fiercely in decisive air battles. Eventually flight training became difficult to carry out due to shortages in aviation fuel. In the fall of 1944, they threw away their wings and left the air group to volunteer as Special Attack Corps members to pilot special (suicide) attack weapons on the surface and underwater. Air group members worked to dig tunnels that served as air raid shelters. As the enemy approached Okinawa, all members become Totsugeki Corps members to defend the country and were stationed for the decisive battle for the homeland. After the air group's establishment until the war's end, lasting 2 years and 5 months, there were about 23 thousand young men who trained in this air group. These budding youths with limitless future desired to fight and did not stay here. They arose to save their country by dying. Through the kindness of prefectural authorities, we were able to erect this monument in a corner of Ryokuchi Park. The pure true hearts of those young men, who died as they rose up thinking earnestly of the country and hoping for peace and prosperity for the people, became the cornerstone of perfect peace. We survivors who learned here erect this monument praying that it may become a stronghold of eternally unchanging peace for humanity. Sekishin means "true heart" (magokoro). When Japan needed to be saved from imminent danger in the last part of the Greater East Asia War (so-called Pacific War), pure-hearted innocent youths from throughout Japan voluntarily joined the Navy (Hiko Yoka Renshusei (Preparatory Flight Training Program Trainees) and others). The red ball depicts a heart burning with patriotic desire while ignoring personal interests and enduring hard training. The whole image seen from the front is that of Japan's national flag, "Hi no Maru." 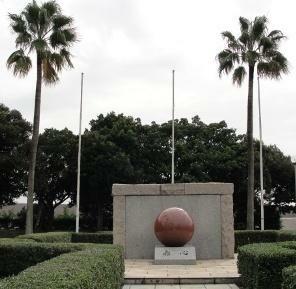 The dimensions of the large round stone and the white stone are constructed in the same ratio as an official "Hi no Maru" flag. A small section on the monument gives information on the dimensions. 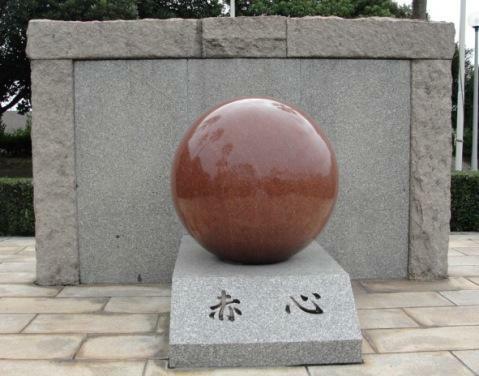 The monument's queen red ball is made in Sweden and has a diameter of 130 cm. The white wall behind the ball has a height of 217 cm and a width of 310 cm. The monument stands on a concrete foundation that is 8 meters square. 1932 - Construction plans made for joint land and sea airfield operated by Kagoshima City. 1937 - Taken over by former Navy. Airport's original form completed with hasty construction and reclamation of land from sea. January 1941 - Kagoshima Naval Air Base established. Becomes main base in southern Japan for transfers and supplies. April 1943 - Kagoshima Naval Air Group established with Ko and Otsu Classes having objective to train Yokaren (Preparatory Flight Training Program) trainees. Together with Yobi Seito and Yobi Gakusei (both translated as Reserve Students), over 23 thousand persons receive training through end of war. March 1945 - Kamikaze Special Attack Corps Azusa Unit takes off from here. August 1945 - Entire area closes due to end of war. July 1957 - First civilian aircraft land after construction of Kagoshima Airport. 1961 - Designated as customs airport. Expands to be international airport. April 1972 - As time passes, new airport in Mizobe opens. At same time, long history of Kagoshima Airport comes to a close. The entry dated March 1945 does not accurately state what happened. The 24 twin-engine Ginga bombers (Allied code name of Frances) of the Kamikaze Special Attack Corps Azusa Unit sortied from Kanoya Air Base rather than Kagoshima. Only two Type 2 Flying Boats (Allied code name of Emily) that were part of the Azusa Unit took off from Kagoshima. They served as lead planes for the Ginga bombers, which carried out a suicide attack on American ships at the Ulithi anchorage on March 11, 1945. One lead plane from Kagoshima with 12 crewmembers was shot down in route to Ulithi by an American patrol bomber. On the right-side of the walk leading to the front of the monument, there is a separate black plaque with the score and six verses of the Kagoshima Naval Air Group Song.